Just before midnight, I was awoken by lights shining up from my neighbour’s yard. Record rainfall was landing on the already saturated ground, streams carrying runoff were crossing my neighbour’s yard and running through their basement suite. Water was coming in through the window wells and over foundation walls. Inside, water was pouring out of plug boxes, and welling up from floor drains. Inches of water covered the floor, running through and right out the patio door. 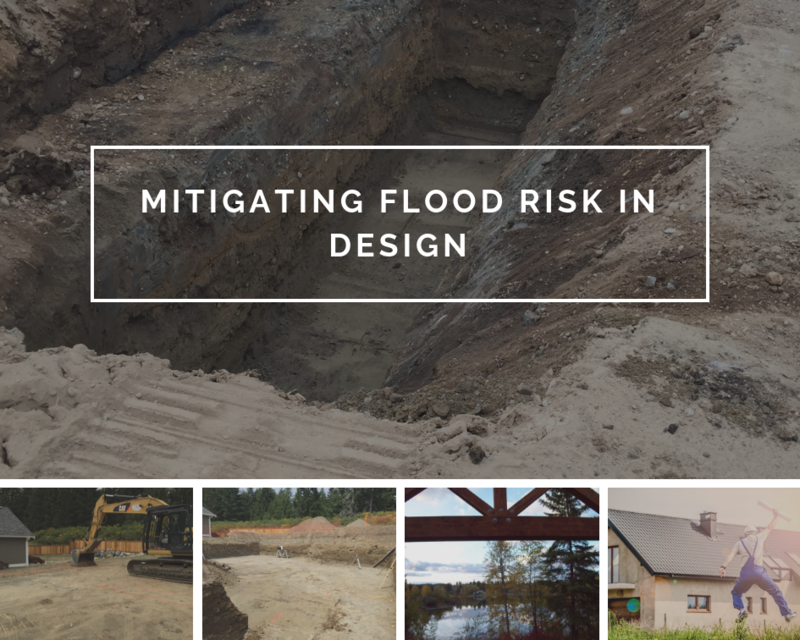 Extreme weather events and flooding is becoming more frequent, so what design considerations can help mitigate flood risk? For the purposes of this discussion, we will look at flood risks from surface and groundwater. Surface water is as it sounds: water that moves along the surface and or through the top layers of soil usually during or shortly after heavy rainfall or snowmelt. Groundwater is usually considered water moving through the lower layers of soil along impervious layers and water tables that may rise seasonally. Several factors influence how a house is sited on a lot. Views, privacy, proximity to access and services, topography all deserve consideration. On smaller lots, setbacks might box in exactly where the building can be sited. But whenever possible choose a building site where water is diverted away from foundations and other sensitive areas such as septic fields. Be aware of low-lying areas that may be dry eleven months of the year, but could become a seasonal stream or pond. This can be the simplest way to mitigate flood risk. Developed properties that have been graded or disturbed create a unique challenge. It can be difficult to tell what natural layers remain below disturbed fill. It may be necessary not only to look at current grades but at the neighbouring topography to determine where seasonal runoff historically ran. During heavy runoff, water will continue to find the easiest path downhill and through permeable layers of soil. Roots from trees and other vegetation that helped prevent erosion and improve the ability to retain moisture are gone. Disturbing soil often damages the soil structure and drainage ability. Excavation during wet weather or when the water table is high compounds such damage. Like setbacks from lot lines, height restrictions may box the house in vertically. But whenever possible set the main floor elevation at a height that will allow grades to be sloped away from the building. Level entries are great for comfort and accessibility, and window wells are at times necessary for light and egress from a basement, but both give surface water an easy path into a building and as such require extra attention. 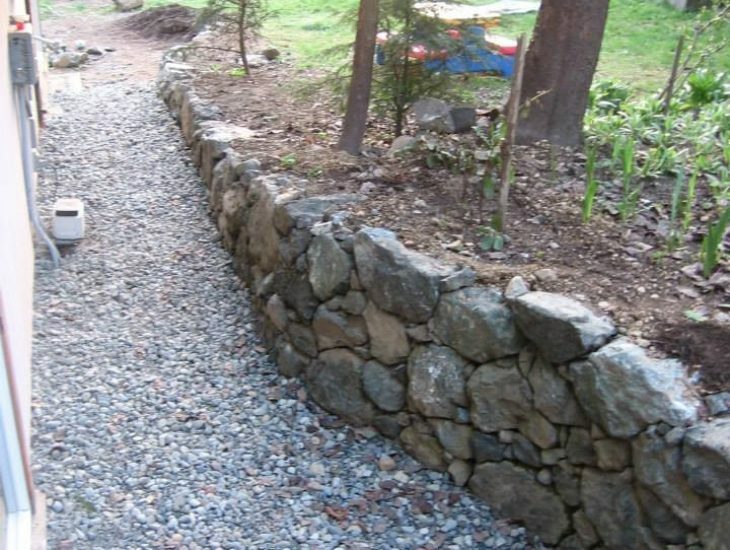 Retaining walls can be used to transition grades farther from the building. Digging test holes and considering soil conditions during excavation is invaluable.Topsoil, organic layers, and loam retain water, but once saturated, water is forced to the surface. These soils slow the movement of water, but in wetter months may become muddy and too soft for vehicle or pedestrian traffic. Sand and gravel allow for good drainage. Which can be great for moving water off the surface and away from foundations. But be aware that a high volume of water can move through these areas quite quickly. Clay, undisturbed glacial till (hardpan), and bedrock can be essentially impermeable to water. Layers of clay are often used to line man-made lakes. If soils above these layers are thin, they will quickly become saturated with water. 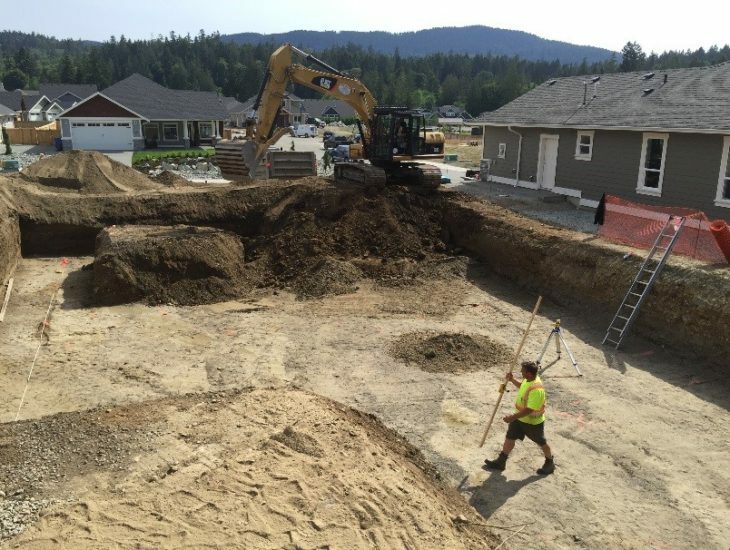 Depending on the type of soil, fill from the excavation of the building site to can be used to adjust grades where necessary, permit drainage, or directing water away from buildings. 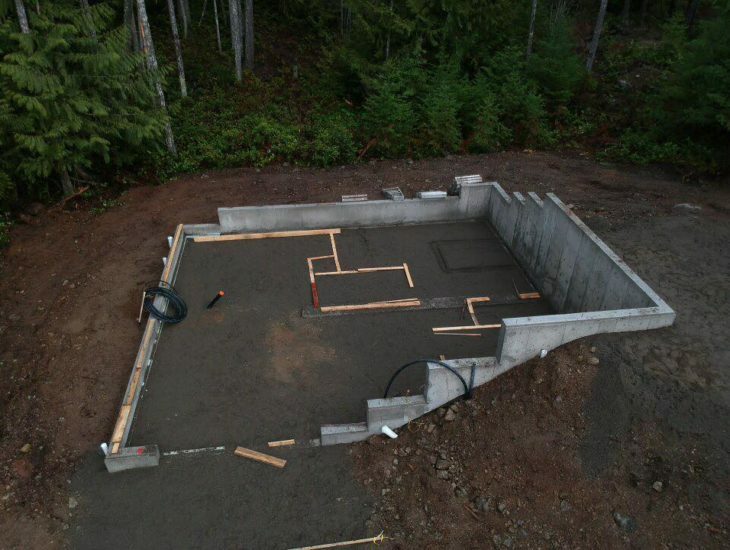 Bringing in material such as well-draining soils for around a foundation may be necessary, and removal of fill might be a consideration. Attention given during design to siting, grades, and soil conditions will greatly reduce the amount of more costly and maintenance depended systems such as drains, foundation sealing, and sump pumps which will be discussed in a later article.